It's the last two months of the year and many people are already shopping Christmas gifts for their loved ones. I really haven't started buying gifts. I guess I'm a last minute shopper. Actually, now is a good time to shop because there are lots of "Holiday Sales" in the malls. Even the online world has ongoing sales. For the next few posts on this blog, I will be brainstorming on gift ideas for our loved ones. As a starter post, let's talk about gift ideas for the men in our lives. Have you bought a gift for your father, brother, husband or boyfriend already? What gifts do you suggest to give them? It can be tricky to buy the right gifts. Of course, you want to give something they will like and use. So before buying a gift, think about their likes and dislikes, hobbies, sports, occupation and needs. You would also need to think about your budget. Don't buy something too expensive using your credit card. You don't have to if you don't have the budget. Below is a list of Gifts for Men that you might want to consider to include in your shopping list. A number of items are quite pricey but try to think what you can buy in relation to these items which you can afford. All right? 1. Power tools like drills and electric screwdrivers and kits that have multi-tools - This is a great gift idea if your man likes working with his hands. My hubby often go to a Hardware Store to look at these items. 2. Toolbox - This will be nice to have for keeping all his tools organized. 3. Watches for men - Get a watch he can wear everyday or for special occasions. For everyday watches, you can get sport analog models with rubber straps. You can also get him a specialty watch for certain hobbies like a smart watch or a diving watch. 4. Men’s cologne - Get him his favorite scent this holiday which usually come in attractive decorative boxes. Take advantage of cologne gift sets. Some offer a sports bag or wallet to go with your cologne purchase. 5. Computers - Who's the man who doesn't love working with computers? Choose desktop versions with LCD flat monitors or handy laptops. Both offer astonishing features that allow users to make and watch movies, have face to face chat using webcams, play games. It's very functional for work and personal entertainment. 6. Cameras - This is one electronic gadget that some men like to tinker with. Choose a point and shoot digital camera or a professional DSLR cameras. 8. Video cameras - Many guys love these. Many are streamlined that they can fit in their palm. They have features like zoom, face recognition, and USB for loading the video onto a laptop. There are waterproof cameras specialized for underwater photography. 9. Cell phones - Guys definitely love this since most cell phones today have multiple features. They have music players, cameras and even video players built in. There are mobile phones with easy touch screen and larger than normal slide open keyboards. They can play games with or without internet capability. 10. Cellphone accessories like ear phones, cell phone cover, waterproof case, SD card and USB OTG flash drive - These little gadgets allow cellphones to be more functional. 11. Flat screen televisions - There are different sizes and types to choose at budget friendly prices. Pick a smart TV so he can get online, too. 12. Portable music devices or DVD or Blu Ray players - This gadget go hand in hand with TVs. 13. Video gaming systems - This is something he can enjoy playing with the entire year. Consoles like Wii, Playstation 3, Kinect and Xbox 360 are so affordable now and you can pick up accessories like extra controllers so he can play with his kids or buddies. 14. Video games - What kinds of games does he like – sports or shooter games? Buy him new versions of his favorite games which manufacturers usually release around Christmastime to boost sales. 15. Handheld video games like the Wii Switch or PSP - This gaming gadget he can take with him wherever he goes to eliminate any boring wait times. 16. Basketball hoop with a top quality backboard and a basketball - This is perfect if he is into playing basketball. 17. Fan gear like jerseys, autographed gifts and cell phone covers - Personalize with the logo of his favorite team or player numbers. 18. Exercise equipment like ab benches, free weights, exercise bikes and elliptical trainers - Get one of these for your man who likes working out at home. 19. A pair of good running shoes and comfortable workout clothes - This is good especially for those who like running outdoors. 20. Bicycle - This is a practical gift these days. This environment-friendly mode of transport can get him to his destination avoiding the hassle of traffic. This is also for him who likes cycling as a hobby. 21. Car adapter, car charger or holder for music gadgets - If your man travels often and loves listening to music, these accessories will be very useful. 22. A GPS - This will be handy to avoid getting stuck in traffic. 23. Car care items like waxes and cloths, conditioners and buffers - These are simple items that he can use multiple times. 24. Books of his favorite author - This is for relaxing your man who is an avid reader. 26. Portable e-reader - With this, he can read his fave books and have access to newspapers and sports magazines, too. 27. Coffee - If your man is a coffee drinker, getting him gourmet coffee or a set of coffee with different flavors will be a good idea. 28. A coffee mug or a coffeemaker - These are perfect to go with the coffees. 29. Tea or other herbal beverages - If your man is not into coffee, giving him his favorite tea or herbal beverage will be great. 30. Gift card or gift certificate - This is a gift you can give if you can't find a suitable gift for him. Why not let him personally choose what he likes? There are gift cards you can get that are specific for dining, watching movies or shopping at the department store. 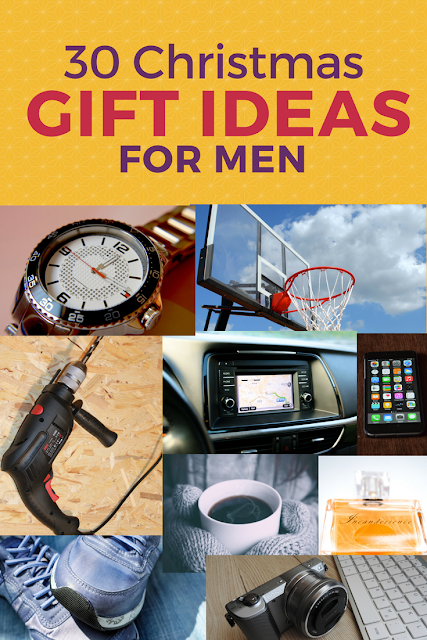 Kindly share your ideas about other gift items that are great to buy for men in the comments below. Thanks. Just in time, Christmas is here na. And sa totoo lang mahirap bilhan ng gift mga lalaki. This is a very helpful list. These are great gift ideas. I find buying gifts for men/boys really challenging. I already started buying gifts. I usually buy gifts last minute but I want to change that this year. I like it so far. Not yet! I don't usually buy surprise gifts. I ask my hubby what he wants and most of the time, we buy it together. Lol. He does the same for me. We're too lazy for surprises. haha. He just usually likes a Nike Tshirt or some decent pair of sneakers. I've yet to buy my husband a gift. Well, technically, I did, pero I want to buy him another one. I'm still undecided, haha. Thank you for this list. I'm still confused as to what to give to my hubby. I found some more ideas from your list. Also good to know that Lazada has gift cards. I didn't know that before.